Posted on Thu, Jan 12, 2012 : 10:30 p.m.
Greenhills senior Michael Kaspark waits at the foul line flanked by Eastern Washtenaw Multicultural senior Yasser Farha and sophomore Momin Malik during the second half at Greenhills on Thursday. Who says it's not how you start but how you finish? The Greenhills boys basketball team led 17-3 after the first quarter and, despite making just one field goal and missing free throws in the fourth quarter, held on to beat Eastern Washtenaw Multicultural Academy 54-44 Thursday night. Greenhills had a 44-28 lead with one to go in the third quarter had dwindled to five with 3:36 left in the game. With a young team sporting a 1-4 record entering the game, Greenhills coach Andrew Wright could be forgiven if he was a little worried. 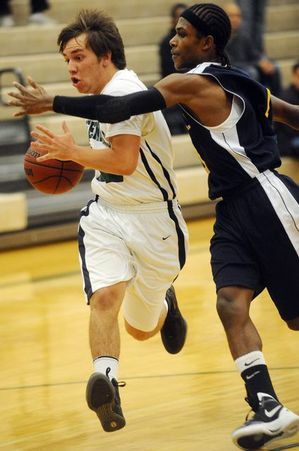 Greenhills guard Andrew Khouri had a game-high 18 points in the Gryphons win. "I said (during a timeout): 'Just embrace the fact that you're playing in a tight game. Enjoy it. Don't run from it,'" Wright said. Greenhills was 4-for-4 from the free-throw line on its next two trips to the line and the Chargers never got any closer than seven points the rest of the way. "There were moments where they played beautifully," Wright said of his team. "There were moments where I think all of them kind of regretted some of the passes that they did." Eastern Washtenaw (3-4), with eight players on its roster to Greenhills' 14, opened the scoring with a Kornelius Saxton bucket on its first possession. The Gryphons closed the quarter on a 17-1 run. "I think the guys came out well," Wright said. "Had (Eastern Washtenaw) a little confused with the 1-3-1 (zone) and then they were able to get out and get in transition a lot tonight." After a win on Friday in which his team had just six turnovers, Eastern Washtenaw coach Jibri Taylor said his team let down. The Chargers had four turnovers in just four minutes on Tuesday. "I felt like my team didn't play all four quarters hard like they did the fourth quarter," Taylor said. "My guys came out, they weren't ready to play." 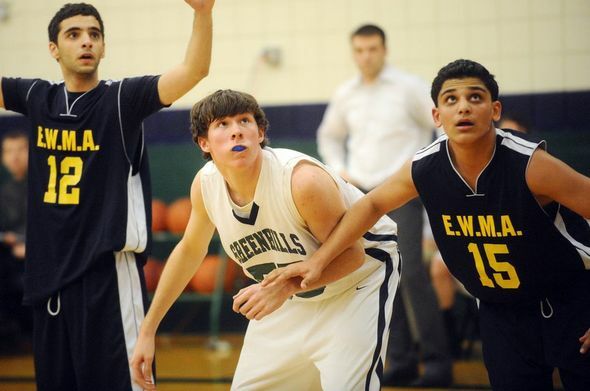 Andrew Khouri scored 18, including eight in the third quarter, for Greenhills (2-4). "He's a really good player. He knows the game really well," Taylor said. "That's who beat us is him. He got other guys open." With a 22.7 per game average, Khouri is by far the Gryphons' leading scorer for the season, but Wright has sometimes been concerned with the number of shots he takes to get his numbers. "We talk with him every time about walking the line between scorer and teammate. And he's getting it," Wright said. Andikan Archibong scored 13, including eight during Greenhills' dominant first quarter. Saxton, Momin Malik and Sami Farha each scored 13 for Eastern Washtenaw. "They came off a good win on Friday," Taylor said of his team. "Maybe they saw this team's record and thought they could look past them." Jason Idalski covers sports for AnnArbor.com. He can be reached at jasonidalski@annarbor.com.